I've been on a reading binge lately, mostly because I've been incredibly behind on my Goodreads Challenge. The good news is that I've read a ton of fantastic books recently, but since I've had such a good time reading, I'm behind on reviews. 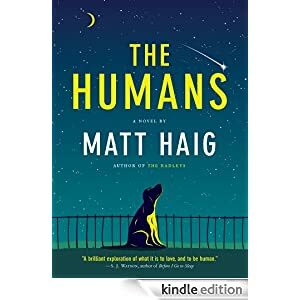 So the book I'm reviewing today is one that I finished a little while ago: Matt Haig's THE HUMANS. It's kind of hard to describe THE HUMANS because whenever I do, I find myself describing a run-of-the mill concept, which, although true, doesn't at all begin to describe the awesomeness that is this book. As far as concepts go, THE HUMANS is about an alien who's sent to Earth in order to (a) figure out who knows about some mathematician's recent discovery and (b) kill all those people. But, along the way, the alien figures out that humans aren't as awful as he thought they were. See? Doesn't that sound like something that's been done to death? Well, rest assured that's not even almost the case. Because of Matt Haig's incredible writing. It's dry, funny, and insightfully smart without being pretentious--a SERIOUSLY hard combination to accomplish. I find myself shying way from literary-type novels because I find them somewhat condescending, but THE HUMANS isn't like that, at all. The observations that "Professor Andrew Martin" (the alien takes over his body so everyone thinks that it's the same old Andrew) makes are so quirky and unusual that it's hard to believe a human even wrote them. For instance, "Andrew" has a serious beef with noses, and every time he mentioned them, I'd have a hard time not giggling aloud at his very unusual critique of a very mundane characteristic. And it takes an extremely talented writer to do that-- to really make me believe what I'm reading, even if it's far fetched. Scratch that, ESPECIALLY if it's far fetched. So well done, Mr. Haig. Well done, indeed. If you're into smart, fast-paced, quirky, unique, and funny reads, then you'll be all over THE HUMANS. So go out and pick up a copy, okay? I'm extremely confident that you won't be disappointed. I am not sure I have ever read an alien book so I am very intrigued! I echo Bailie - I've also never read an alien book so I'm excited to add this to my goodreads list!